As of June, the iPhone 5(s AAPL) was only nine months old, but it continued to lose buyers to a nearly three-year old and a 21-month old model iPhone, according to data compiled by Consumer Intelligence Research Partners. A trend that began almost as soon as the iPhone 5 went on sale last fall continued during the April-June quarter among U.S. buyers: a larger percentage than ever is choosing the iPhone 4 and 4S, which are free and $99, respectively, with a two-year wireless contract, over the latest model iPhone. Sales of the iPhone 4S dipped a little bit between the first and second quarters of this year, while the 4 grew. At the same time the iPhone 5 as a share of overall iPhone sales sunk slightly during the last quarter from 53 percent of sales to 52 percent. The reason is pretty obvious: a free or $99 iPhone that looks basically similar to the $199/$299/$399 iPhone is very attractive. Sprint(s S), for example, is split on the amount of the iPhone 4S and iPhone 5 it sells, while T-Mobile is by far the strongest with the iPhone 5 with 82 percent of its iPhone sales during the quarter. AT&T(s T) and Best Buy(s BBY) are also heavily skewed toward iPhone 5 sales. 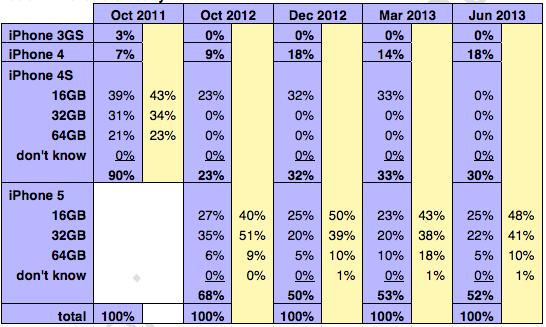 Apple’s iPhone 5 sales as a share of overall iPhone sales, is among the lowest: just under half. Meanwhile, the iPhone 4S is doing almost nearly as well as the iPhone 5 in the company’s own stores. It became apparent to most from the start that the iPhone 5 was much different than its predecessors: its popularity as a share of new iPhone purchases has fallen off faster than any others. After launching in September and accounting for 68 percent of all iPhone sales in October, by March it accounted for just 53 percent of iPhone sales. The iPhone 4S, released in October 2011, for example, still accounted for 63 percent of sales 10 months after it launched. This is not necessarily bad news for Apple: it’s a plus that Apple is able to attract customers looking for a less expensive smartphone, instead of them choosing an Android or Windows device that’s cheaper, for example. Apple CEO Tim Cook said specifically last quarter that the company is hopeful the iPhone 4 will be a tool to recruit new iPhone owners, especially overseas and in emerging smartphone markets. But the prices of the (subsidized) iPhone 4 and 4S are lower, which can impact Apple’s overall financial results, bringing down the average selling price as well as potential profits from iPhones. The iPhone is Apple’s most important product and sales of it, margins on the device and Apple’s ability to continue selling it in large numbers nearly seven years after the debut of the original will feature heavily inot the company’s fiscal third-quarter earnings scheduled to be published tomorrow. I went from a 3GS back in December to a 5. Sold my 3GS for $110. Got the 5 for $150 at best buy. I had some connector stuff but not a ton. Did the same for the wife. Youngest daughter got an IPod touch 5. And now this summer other daughter got a IPhone 5. We are all on the same connector. No big deal. Sold the one speaker we had. I also realized I never played music on my alarm clock. -$299 64GB iPhone 5S/6 in the usual black or white, A6X + 1GB RAM. I could see a $199 iPhone Mini with 32GB, but Apple doesn’t usually like forcing people to make choices that close. More likely is a $399 128GB iPhone 5S/6. The keynote focus will be something like “Pick your price point, we have a current device” or “More space for less dinero”. Even as a mobile experience manager, I still skip a release. My iPad is often more up to date. Apple may simply have to figure out how to increase its releases if it wants to sell more devices at a faster clip. I would note however that finding Android devices that are clear improvements over their predecessors isnâ€™t easy. Shocking news! The free iPhone is doing better than the $99 iPhone, which is doing better than the $199 iPhone. Who’d have guessed? I recently upgraded my Mom from a 3GS to a 4S and price wasn’t the driving factor. For me I saw the 4S as my last chance to upgrade her phone and not have to deal with all new accessories, etc. due to the change in connectors. I have to imagine other people have had the same thoughts. I finally switched from my 3GS to a 4S, after testing an iPhone5 for nearly 2 months. I returned the 5 and got myself an unlocked 4S 64GB white. Main reason for returning the iPhone5 was the new connector, that is only good for Apple and useless for the users. There are so many cables, adapters, holders with the 30pin connector and practically nothing available with the useless new lightning connector.